It's not totally finished (buttons again), but it's close. It's made out of dupioni silk, and while I was cutting it out I was trying not to panic that I was using so much silk and trying my best not to focus on the thought that if the project didn't come out exactly the way I wanted it to it might be a massive waste of the most expensive fabric in my sewing stash, which could have gone to make something like six of my most popular snoods. Still I nervously watched as it came together and it wasn't really clear until the last moment when I finished the last enclosed seam and flipped the whole thing over that it actually looked exactly like the picture that I already had in my head. I know as I've been making the gown a few people have asked "why a gown for a boy?" For me, it's totally a matter of personal preference. 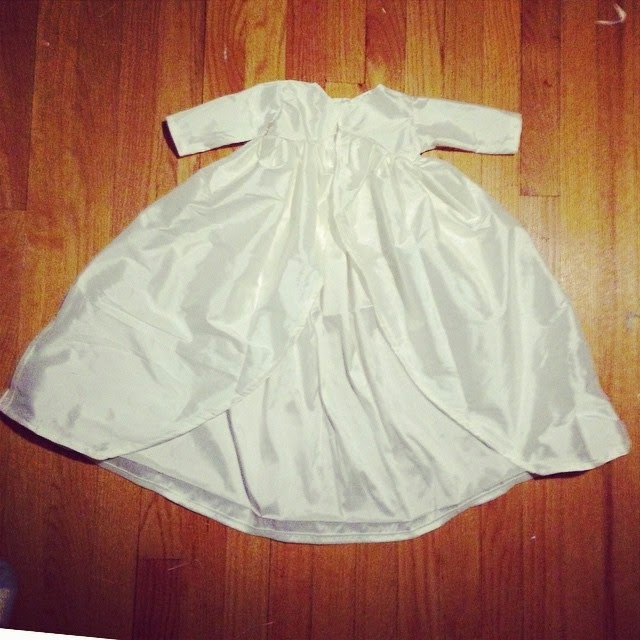 I just like the look of a baptismal gown better than most of the little suits out there. You can probably just blame it on my love of old fashioned fashions. One of the problems I actually find myself having with a lot of the boy's gowns and suits available is that I feel like a good number of the ones I've run across (because I obviously have spent way, way too much time looking at baptismal gowns online) will, to me at least, look dated fairly quickly, kind of like that prom dress that seemed so perfect in 1980 (or 1970, or 1990... or...) that now looks kind of ridiculous in hindsight. But again, that's totally a matter of personal preference. I'm betting there are tons of people who, as a matter of personal preference, don't like gowns for boys. And it isn't that I don't like little suits (I see tons of adorable little babies looking perfect for their big day in my Facebook news feed). I just like gowns more. I don't feel like one is better than the other, just that it's a matter of taste. If the question extends beyond why gowns now, to why gowns in the past, I think that the main reason gowns were traditionally worn was because little boys, up until the start of the 20th century often wore gowns in the western world, from birth to anywhere from the age of 2-5. I remember reading a really interesting article about how young boys in Victorian times wore dresses, which of course, I can't find now, but this Wikipedia post goes into it a bit and how "breeching" was actually a rite of passage for boys when they were old enough to wear pants. Part of the carry over from that is also likely that many people have antique gowns that are handed down, that generation after generation in their family has worn. Anyways, that's the latest off of my sewing machine, and my explanation for anyone who's wondered or asked why the gown for a boy! After getting so far on the gown I'm cautiously optimistic that I might actually finish the entire thing before the baby arrives... as long as he continues to stay put. Less than a week to go! So excited for you, Cam! And the gown is just beautiful! 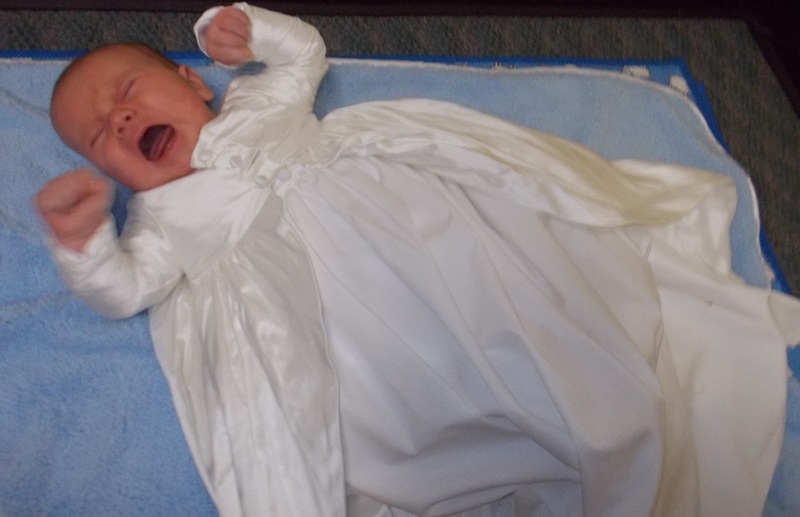 Henry and my nephews have all worn baptismal suits, and while adorable, they are a pain in the *neck* with bunching up in the back and all of the little pieces (vest, tie) never lying flat properly. So I think your gown is just awesome, and looks so much more comfortable! Beautiful! I think maybe part of the reason boys wore gowns is because people didn't know until birth whether they were having a boy or girl, and who wants to hand sew a gown while recovering from birth and caring for a newborn! Also, I imagine clothes were a lot less disposable (better quality and more expensive) before they were mass produced in China, so families probably wanted to get as much use as possible out of them. We have a family portrait photo of my aunt and two uncles taken around 1913 or so, when they are children. In the photo my aunt is about 5 and wearing a dress. One of my uncles is about 3, and he's wearing a smock, and my other uncle looks about 8 months, and he's wearing a little dress. I think gowns/dresses on little boys was common, but of course, there's no one still alive to tell me why they dressed boys that way.